The Penny-A-Day (PAD) program began in 1974, when Lodges we asked to “pool their pennies” to help their brothers, sisters, widows and children in need. 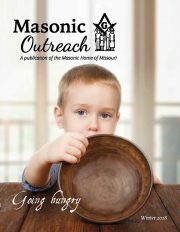 In 2016, Chapters began supporting the Masonic Home’s programs through the Penny-A-Day program as well. With only $3.65 per year per member, this program is just one of the ways Lodges and Chapters can support the efforts of the Masonic Home and build membership in The Vincil Society. To submit Penny-A-Day contributions, please use the Lodge PAD Remittance and mail by August 31st of each year. To order more stickers or if you have questions about the Penny-A-Day Program, please contact our Annual Giving Officer at 800-434-9804.